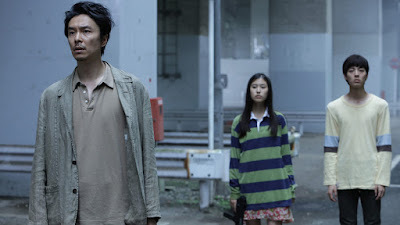 One of Kiyoshi Kurosawa's messiest film BEFORE WE VANISH is a one of a kind science fiction film (as are all Kurosawa's films). It is a kind of I MARRIED A MONSTER FROM OUTER SPACE meets THE ARRIVAL but with a comedic edge. The plot of the film has an alien race sending three envoys to earth and taking over the bodies of earthlings in order to study us and steal concepts from us. They steal the notion of family, work, ect from people they meet leaving them in a psychotic state. One body is that of a teenage girl who wanders alone, one a teenage boy who ends up traveling with a reporter and the third is in the body of a married salaryman whose wife doesn't understand the change that has come over him. The trio must gather their information and then link up so they can call the invasion fleet to wipe out mankind. What would seem to be bleak tale, the earth is doomed isn't it?, is in an often deadpan funny film about aliens trying to understand humans- and humans forced to try and understand what the words and concepts really mean. What exactly is family? The aliens want to know and you'll be forced to consider what these things mean as well. As an intellectual exercise this film will get you going. (And even emotionally as one turn toward the end had me tearing up). The film also creates a real split with in the audience members in that we feel for the aliens. We genuinely come to like them so we root for them to be successful in their mission-which means we are hoping they'll wipe us ot. it's a weird weird feeling that leaves us unsettled. The first of two problems with the film is that Kurosawa is operating in his "the plot isn't as important as the ideas" mode with the result there are all sorts of plot issues and logic problems that show up. If you need everything to tie together look elsewhere. Kurosawa frequently is not interested in making sure the plot works as he is moving his thematic elements along, and that is the case here. As good as Kurosawa's films are his lack of narrative control is I think is one reason his films often don't get a release in the US. The other problem with the film is the first hour is rather slow. Yes it's all set up but its also a tad obtuse with the film operating on its on rhythms. You have to hang in until the film finally begins to move. Personally I like the film a great deal. Flaws and all any Kurosawa film is better than most other directors film simply because he is always trying to do something,even if it doesn't work. Recommened- though the two NYFF screening were among the first to sell out.